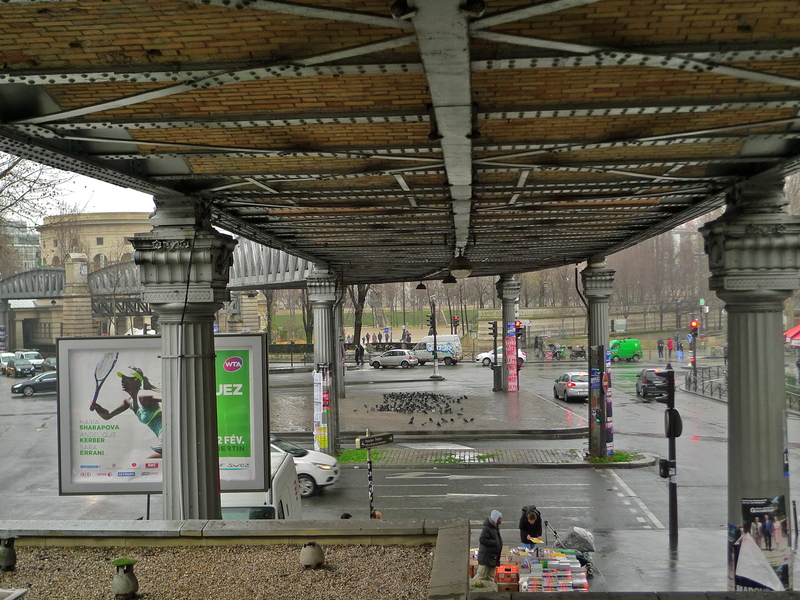 IT’S PERHAPS BEST SEEN from outside the McDonald’s restaurant at the corner of the Boulevard de la Villette and the Avenue Secrétan in the 19th arrondissement. 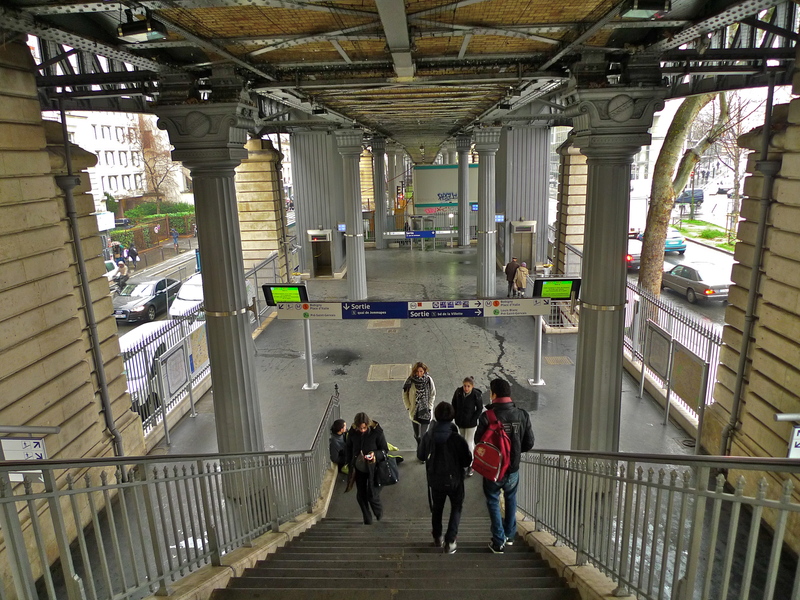 From here you can see the elegant, sweeping curve of the Paris Métro as it approaches the Métro station Jaurès, one of the four stations aériennes on Métro Line 2. 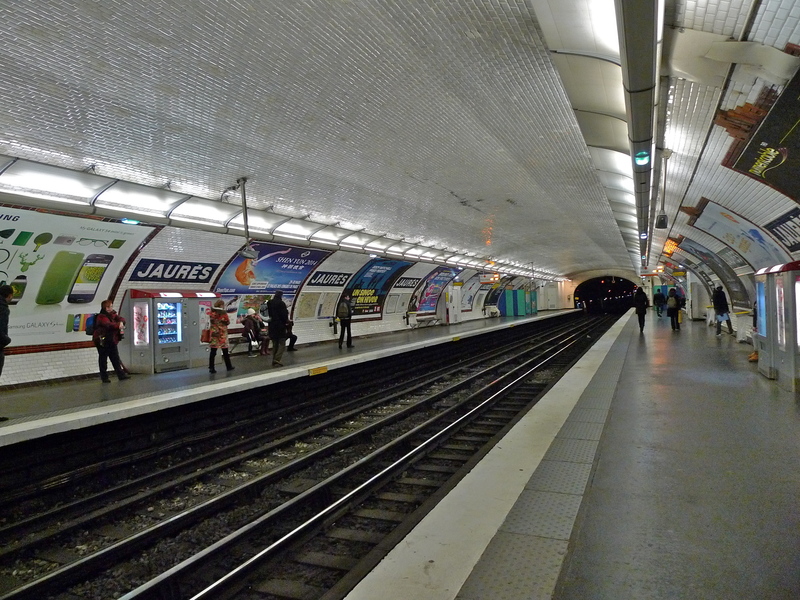 Although Métro Line 2 arrives at Jaurès station well above ground, the station also hosts two other lines, Line 5 and Line 7bis both of which are below ground. 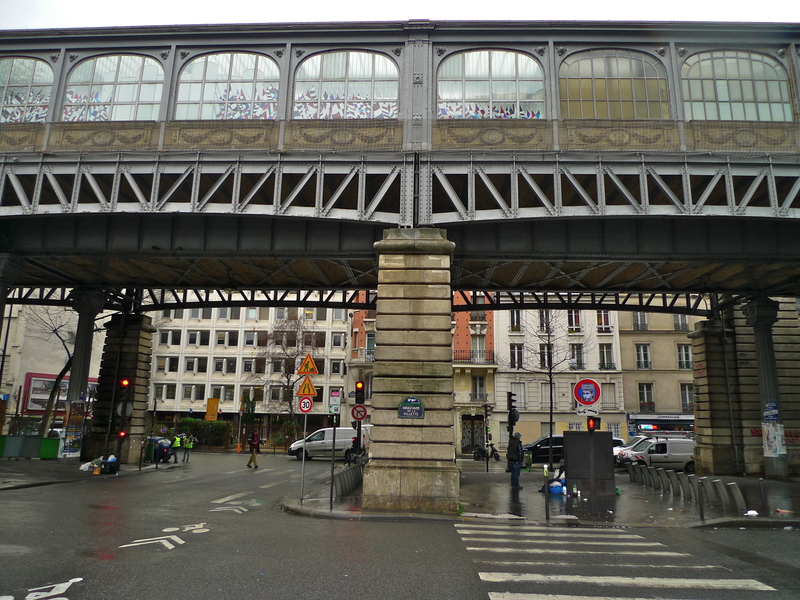 The original station, called Rue d’Allemagne after a street close by, opened on 23rd February 1903 as part of the newly completed Métro Line 2 running between Porte Dauphine and Nation. On 31 July 1914 the socialist and pacifist politician Jean Jaurès was assassinated in a Parisian café, Le Croissant, in rue Montmartre, by Raoul Villain, a 29-year-old French nationalist. Just three days later, war with Germany was declared and suddenly German names became unpopular. 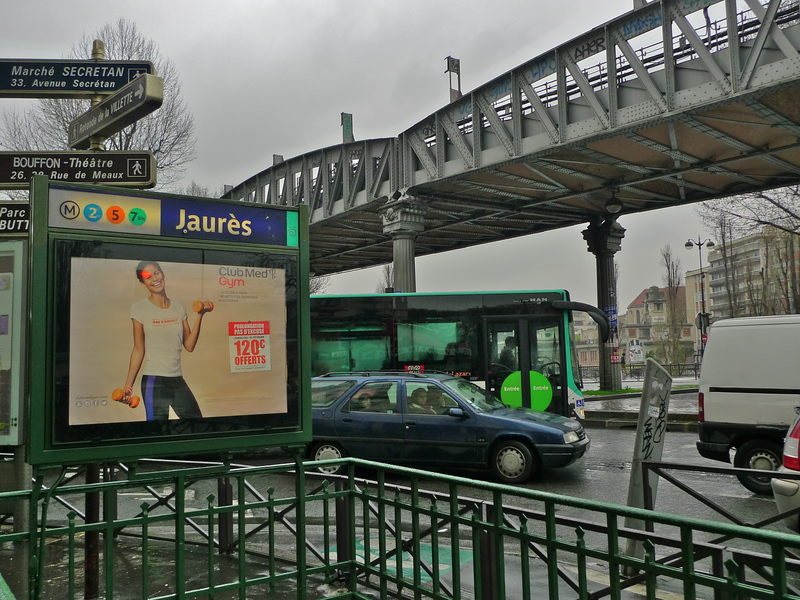 The street name rue d’Allemagne was expunged and replaced by the avenue Jean-Jaurès. 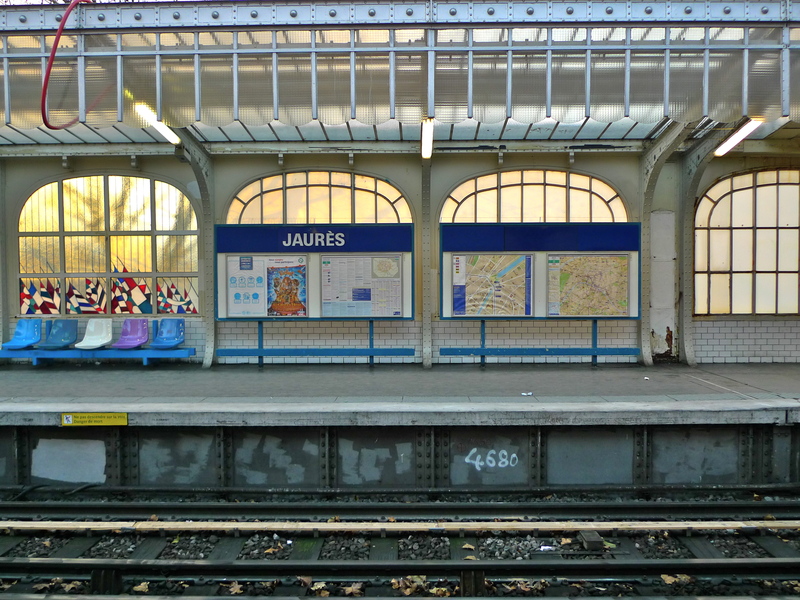 With the change of the street name came the change of the name of the station, rue d’Allemagne became simply Jaurès. Métro station Jaurès is one of the four stations aériennes on the 2 km elevated section of Métro Line 2 and so the Line 2 platform is well above ground. 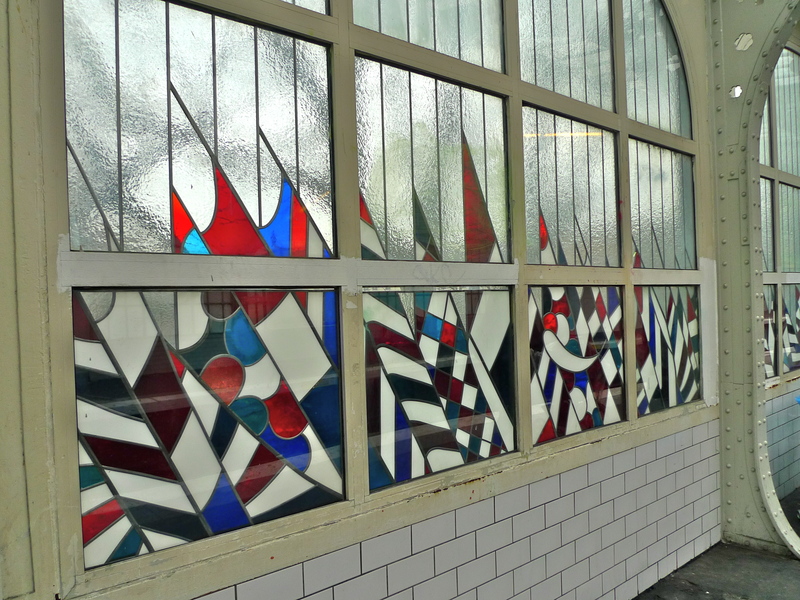 As well as the magnificent glass roof the platform also boasts a rather unusual stained glass window. Designed by the artist Jacques-Antoine Ducatez, this window was installed in 1989 to celebrate the 200th anniversary of the French Revolution. It depicts the people carrying flags marching towards the Bastille prison, the taking of which launched the Revolution. 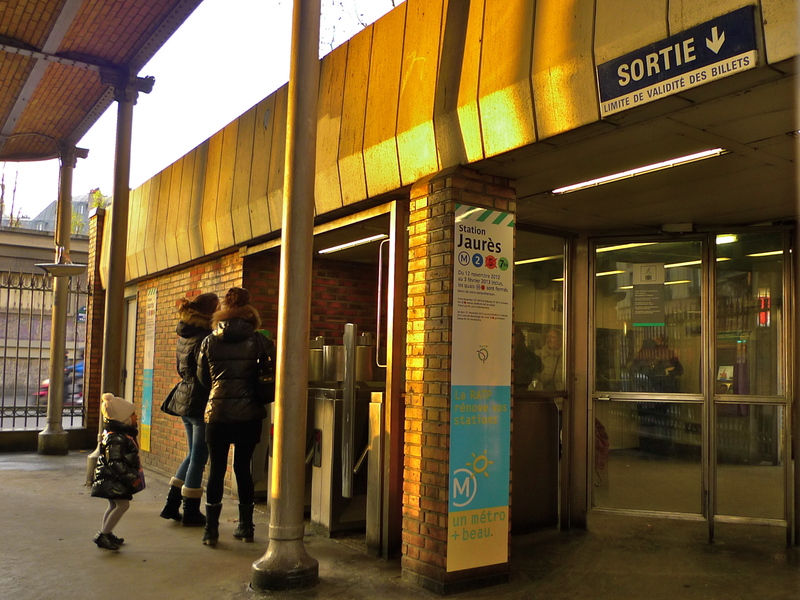 Line 2 was the first Métro line to open at Jaures station but a further line, or at least part of a line, was added soon after. 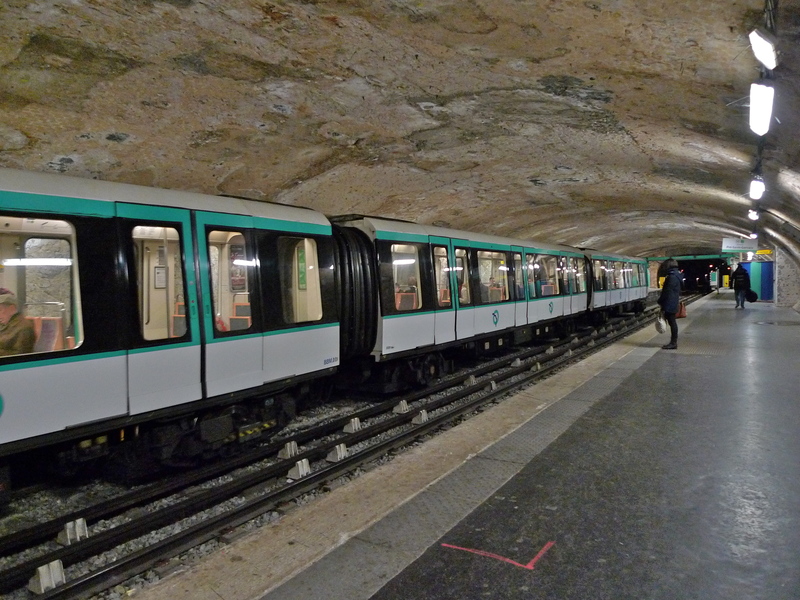 In January 1911, a branch line of Métro Line 7 to Pré Saint-Gervais was incorporated. 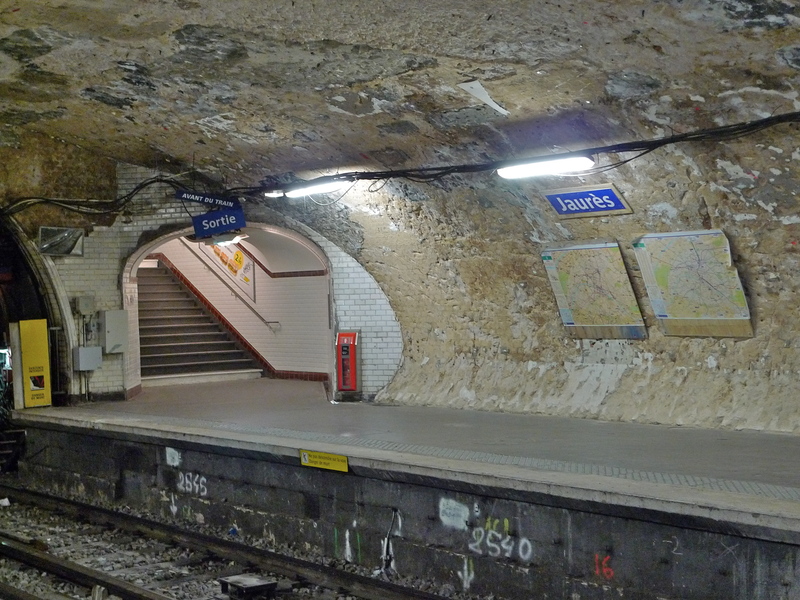 This branch line remained until 1967 when it was formerly separated from Line 7 to become Line 7bis, or Line 7a. 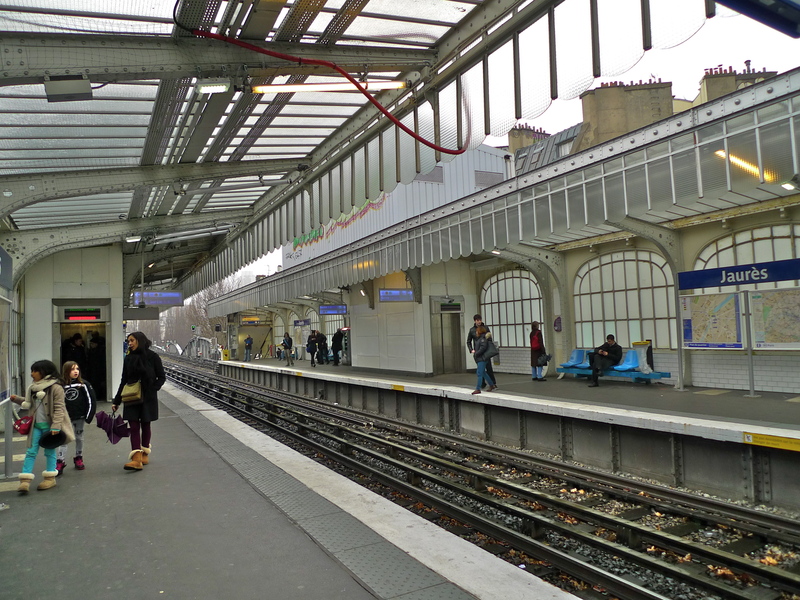 Line 7bis is the deepest of the lines that pass through Jaurès station and, at the moment, it looks by far the most desolate. All the tiles together with most of the fixtures and fittings have been removed in preparation for renovation work which is due to be completed by the end of June this year. 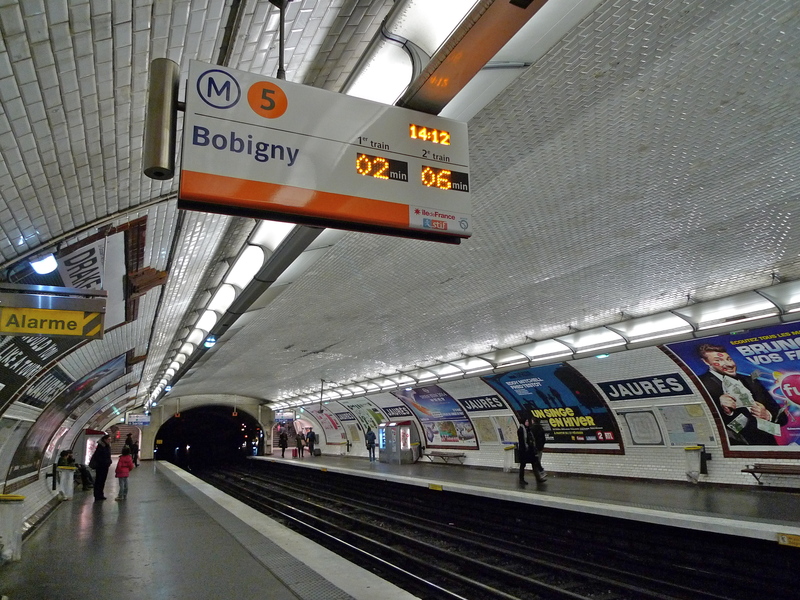 Sandwiched between Line 7bis and the aerial Line 2 is Line 5, which crosses the east of Paris from Bobigny to Place d’Italie. 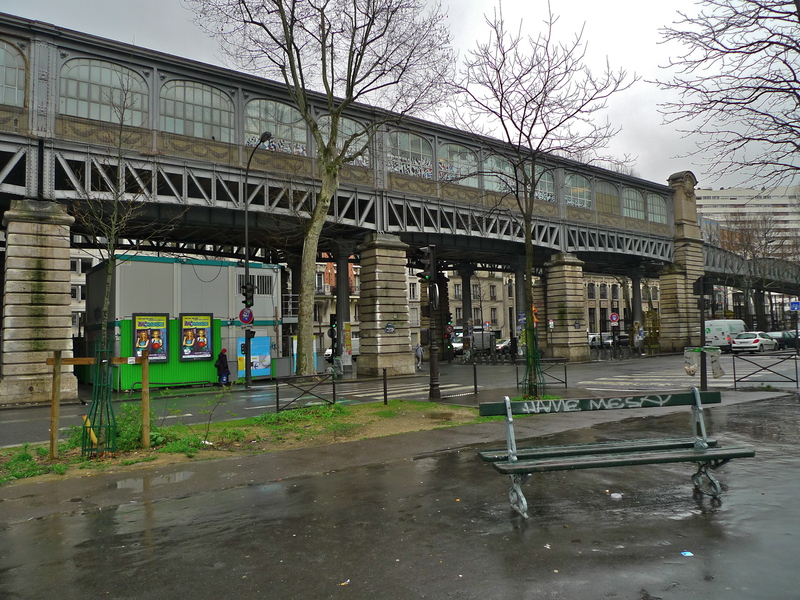 Line 5 arrived at Jaurès station in 1942 as part of the extension of that line from the Gare du Nord to Eglise de Pantin. 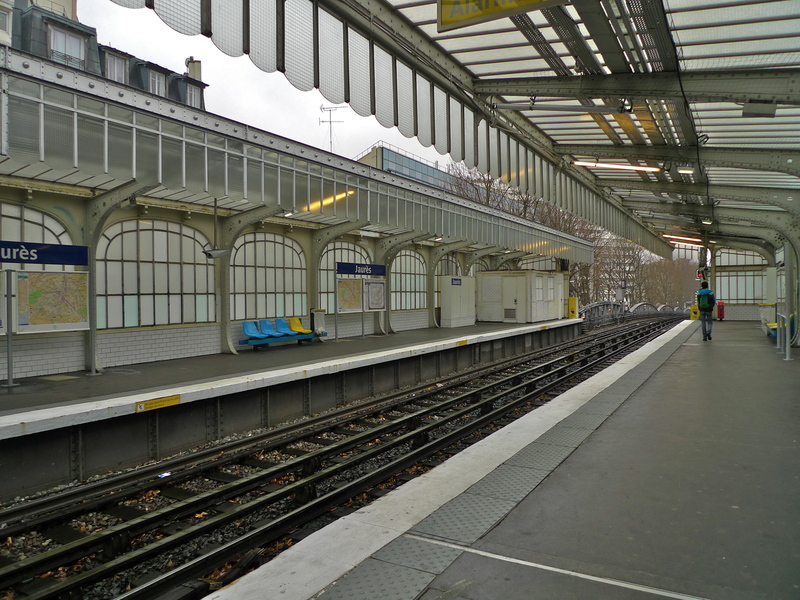 In my sound portrait you can hear the sounds from all three of the Métro lines that pass through Jaurès station, Line 2, Line 5 and Line 7bis.